In the past few weeks, I have gone through a mental “What To Do Before Labor Day” list. Get over to Prairie Farm and visit our favorite neighborhood turkeys, bunnies and llamas? Check (The Champaign Park District farm will be done for the summer after Labor Day). Plan an afternoon of splashing around at Sholem Aquatic Center? Pending (it also closes for the season after Labor Day). 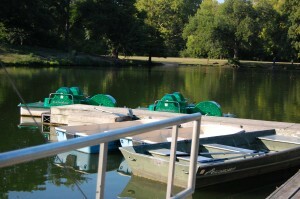 A boating outing in Urbana’s Crystal Lake Park? Finally accomplished, this weekend. With lakes/ponds/rivers few and far between in these parts, there are very few places to rent a boat, and even fewer where it is relatively safe for the real little ones. Among the known options within a 30-mile radius: the Clinton Lake Marina (where pontoon boats are available for a large chunk of change) or rental of canoes, kayaks or tubes at Kickapoo Landing on the Middle Fork of the Vermilion River. Those vary in price, from $18 on up. 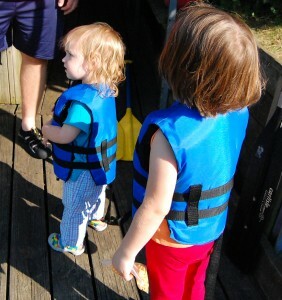 My little sailors, getting ready to board the paddle boat at Crystal Lake Park. We decided to go for close, easy, and inexpensive. It may not be the biggest lake, or the most scenic, but going boating on Crystal Lake in Urbana was a way for our young daughters to dip their toes in the boating waters — pun intended. Last weekend, we rented a paddle boat and did a full spin around the lake. Our little girls enjoyed the ride, helping to steer the boat and even trying to do some of the pedaling. The highlight of riding around Crystal Lake was going under the bridges. We also had a view of all the people fishing, which amused the girls, and they loved saying hello to anyone within shouting distance. We went in the early evening, when the sun was starting to set and the heat of the day had mostly subsided. Thankfully, no one tried to jump in! We couldn’t beat the price – we paid $9 for an hour rental, and that was for our family of four. I’m not sure at what age they are supposed to count, but they didn’t charge us for our 4-year-old. Coast Guard-approved life jackets are provided and are required to be worn by the children; there are a range of sizes from infant to adult (although the one we received for our 20-month-old was too big and she complained about it most of the time we were out on the water). Here’s the good news: the boat rentals are open on Saturdays and Sundays through September 19, from noon to 7 p.m. (and also on Labor Day). In addition to the paddleboats, canoes and rowboats are also available; fees range from $6 to $11 per hour. The Boat House only accepts cash or check, so be prepared; also, you must leave a valid driver’s license or major credit card is required as a deposit on all rentals. What is on your end-of-summer checklist?